Reader Girls are the host today for the Bleeder Blog Tour. 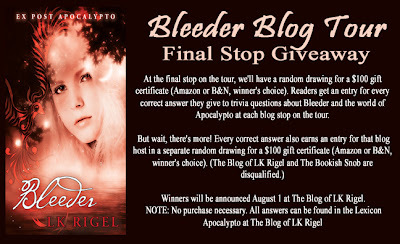 Author L. L. Rigel has a guest post and is offering a giveaway. We welcome all. Blurb: The King of Garrick wants to kill her. We welcome L. K. Rigel. 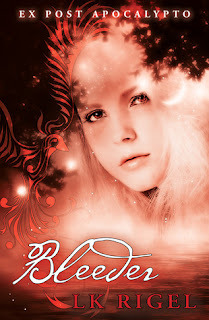 Thanks so much to the Reader Girls for hosting Bleeder on its blog tour and for having me here today. My post is inspired by the Reader Girls’ trivia question for the $100 Amazon or B&N giveaway – so no excuses for getting the answer wrong! 1. Sear two or three chicken breasts. To sear: Heat a couple tablespoons olive oil in pan until it shimmers. Salt and pepper the chicken breasts. (sea salt is good) Place in pan. Using tongs, turn the meat over ONLY when the meat releases from the pan. If you have to pull the meat, it's not ready. It will come away from the pan by itself. Only sear an amount of chicken that leaves plenty of space in the pan between the pieces. When they release, take out of the pan and keep searing if you have more chicken. Slice the chicken. Don't worry that it's not cooked inside. It will finish cooking when simmering. Cut to bite sized and set aside. When you finish searing, pour in 1/4 cup of water and mix it up to use in a minute. Pour the chicken juice into my simmer. Dice 2-3 cloves of garlic, to taste. In a separate pan on medium low heat, heat some olive oil. Throw in a bunch of rosemary and the garlic just until the garlic is starting to brown. Cut up 5-6 blood oranges (quarters). Peel off the rind over the pan (the juice will drip in) and throw in the peeled oranges. It doesn't matter if the oranges smoosh. Add more rosemary if it seems like you need it. Add in 3-4 tablespoons of honey (4 TBS would be 1/4 cup) and stir the lot up. Add the juice from the chicken searing pan. If you don't have enough liquid, add a little water (probably depends on the oranges). Add in the seared chicken, stir and cover, making sure liquid is just simmering. Simmer until chicken is cooked and tender. -- Doesn't take long, maybe 15-20 minutes? Check your seasoning when it's close to done. You may or may not need more salt and pepper. 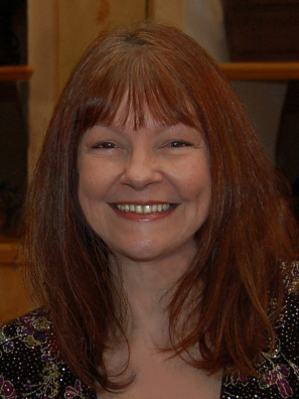 About the author: LK Rigel lives in California with her cat, Coleridge. She was once a singing waitress, scored the independent science fantasy karate movie Lucid Dreams, and was a reporter for the Sacramento Rock 'N Roll News. Her BA is in humanities and religious studies. Her work has appeared in Literary Mama and Tattoo Highway. Her short story "Slurp" will appear in Anne Frasier's 2011 Halloween anthology Deadly Treats published by Nodin Press. A recipe for chicken!!! I am so chickened out it's not funny. Will have to save this one for another day. We are having Pork Chops for dinner tonight!